In honor of Heart Health Month, Hamilton Grove Healthcare and Rehabilitation Center is pleased to present this important information about cardiac rehabilitation for Congestive Heart Failure. Congestive Heart Failure (CHF) is not only a serious condition, it is the leading cause of hospitalization in seniors. In CHF, also called Chronic Heart Failure, the heart is weakened and cannot pump blood effectively. CHF is not a death sentence, but it must be treated early — and effectively. CHF can be treated with a variety of medications, including beta-blockers, diuretics, and ACE inhibitors, but lifestyle changes are also important. In fact, lifestyle changes can even reverse CHF. What lifestyle changes make a difference? Eliminating tobacco and alcohol, managing stress, restricting salt, being physically active, getting adequate amounts of quality sleep. No surprises there. The real issue is not what changes to make, but how to make them, and, especially, how to make them stick. According to an article published in the Journal of the American College of Cardiology, cardiac rehabilitation programs improve both quality-of-life and clinical outcome in patients with CHF. Cardiac rehabilitation programs, such as that offered Hamilton Grove Healthcare and Rehabilitation Center, in Hamilton, NJ, includes carefully guided exercise, as well as extensive support for therapeutic lifestyle changes. While conventional wisdom once held that exercise was unsafe for people with CHF, today we know this is not true. 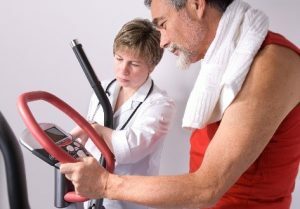 However, in order to help — and not harm — the CHF patient, exercise must be carefully controlled and monitored by knowledgeable therapists, who communicate regularly with the patient’s doctors. Proper exercise, however, not enough. Other lifestyle changes are also required. Unlearning the habits of a lifetime is not an easy matter. However, a team approach, incorporating physical therapists, occupational therapists, dietitians, social workers, and other healthcare personnel, is proven to be the most effective way to help people with CHF lead a healthy, active life. Hamilton Grove Healthcare and Rehabilitation Center, in Hamilton, NJ, takes a restorative approach to cardiac care, maximizing function and mobility in a positive and upbeat atmosphere. Our state-of-the-art gym and SMART rehab protocols ensure the best outcomes for cardiac rehab patients.